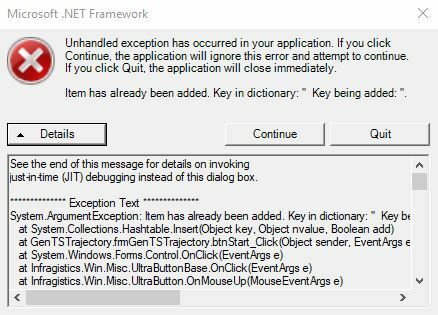 User encounters a .NET crash, “System.ArgumentException: Item has already been added. Key in dictionary: ” Key being added: ” “, while attempting to generate TerraScan trajectories from LIDAR Source strips. We suspect corrupted entities on the layer in question. Create a new trajectory layer and try creating the trajectories to the new layer.